-> Very recommended. This is exactly what chicken teriyaki should taste like. broiled, then slightly barbecued with skin on, leaving the skin slightly crispy and the sauce infused under the skin. Top-notch. -> Very nice. I can tell that the sauce is homemade. Not too strong and tart like the ready-made ones, with the prefect balance of ingredients. -> The piece de resistance, as far as I'm concerned. The main reason why I come here. Prefect cream croquette with ragout and bits of chicken and vegetables inside, just like in Japan. For those of you familiar with regular korokke (potato-based croquettes) and the Dutch Kroket, this is like the cross between the two. Think korokke, but lighter (since it contains no potatoes), but denser than the kroket. I don't even know how to describe the delectable taste of this thing, so just try it! The restaurant had its peak (of business) around 2 years ago - they didn't even accept reservations on weekends (including Fridays). But now, they started to accept reservations on weekends, perhaps a sign of business slowing down. However, the place is still always packed, and the food quality doesn't decline, so I still love dropping by this place every now and then. As with many izakaya-style Japanese restaurants in Sydney, don't expect all your orders to arrive at the same time. That's why Ju Ju recommends food sharing, which is basically the very concept of izakaya dining. Food will arrive haphazardly, but service is really good (considering how busy the place is). 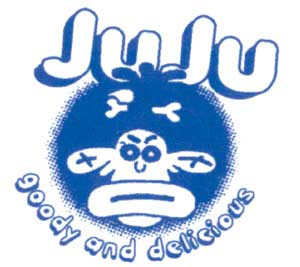 Unlike restaurants such as Fujiya, the waitresses at Ju Ju are very professional, prompt, friendly, and reliable. The restaurant is never understaffed (unlike stupid Fujiya), food is always excellent no matter how busy they are (unlike stupid Fujiya), portions are very generous (unlike stupid Fujiya), and prices are reasonable (again, unlike stupid Fujiya). So yeah...Ju Ju. nice place. Unlike stupid Fujiya. Too bad it's quite far away from the city (unlike stupid Fujiya).